Connecticut renters face one of the least affordable housing markets in the country, a new report says, and the state’s low-income renters face an especially difficult challenge in affording a place to live. According to a recent report by the National Low Income Housing Coalition, the average Connecticut renter’s income is well below what would be necessary to afford a typical two-bedroom apartment, and low-income renters may face an even greater struggle due to major reductions in housing assistance by the Trump Administration. 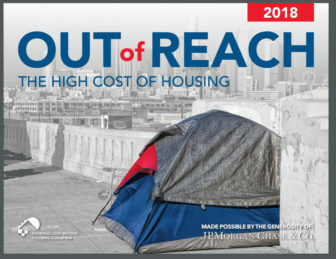 The cover of the 2018 National Low Income Housing Coalition report. The NLIHC’s 2018 Out of Reach report echoes common concerns about rent costs across the nation. The federal government and the NLIHC report use the same definition of housing affordability, which is that rent should not exceed 30 percent of one’s income. The U.S. Department of Housing and Urban Development (HUD) calculated that a standard quality two-bedroom apartment in Connecticut would cost $1,295 a month. A renter would have to earn nearly $25 an hour for this to be affordable, according to the NLIHC. The organization calls this the “housing wage.” Connecticut has the ninth highest housing wage in the nation. Housing Wages vary from $36.13 in Hawaii to $13.84 in Arkansas, but the problem is everywhere: there is no state or county where a standard two-bedroom apartment set at the HUD fair market rent meets the criteria of affordability for the average renter, according to the report. The national average renter would need to make $1.02 more per hour for a two-bedroom apartment to be affordable, the report says. In Connecticut, the tenant would need to make $5.22 more an hour. This is the eighth widest gap between average renter wage and housing wage in the country, making Connecticut follow behind the likes of Hawaii, California, Massachusetts, and others. The situation is particularly dire for low-income renters. The NLIHC Connecticut report estimates that an extremely low-income four-person household in Connecticut would make no more than $28,720 a year, or $2,393 a month. Living in a standard two-bedroom apartment at fair market rent would cost more than half of that household’s monthly income — well beyond the standard of affordability. 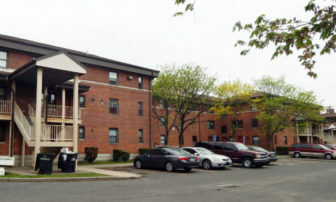 The report also estimates that there are about 140,500 extremely low-income renters in Connecticut, constituting nearly 30 percent of all renters. About 89 percent of them are elderly, disabled, or in the labor force. Already facing housing insecurity, they are further threatened by the Trump Administration’s proposed $8.8 billion budget cut to HUD. The NLIHC says it would be one of the most significant reductions to urban housing in decades. The cost reductions could take many forms, according to a report by the Center on Budget and Policy Priorities. Because there is a severely low inventory of affordable housing units, the HUD Housing Choice Voucher Program was created to supplement low-income families’ rent payments for other apartments. A report from the budget center predicts that the federal reductions in funding will result in the cancellation of 200,000 families’ vouchers, meaning that these families will lose their rent subsidies. There are also plans to increase the amount of money households receiving assistance would have to pay toward housing — from 30 to 35 percent of their income — pushing them beyond the government’s own standard of affordability. What Kemple describes is a self-perpetuating cycle: low-income households can’t afford rent even in the places where rent is most affordable, and the sacrifices they must make to keep a roof over their heads often result in other forms of instability. Moving around a lot may mean that children are repeatedly pulled out of school. It may also mean that parents have unstable access to transportation to work, risking unemployment. All of this, and more, intensifies the impacts of poverty and pushes households closer to homelessness. Trump’s budget proposal frames the issue of housing insecurity as state or local business, not a federal issue. But Kemple notes that budget cuts will trickle down to deprive local nonprofits who fight housing insecurity of essential resources. These budget cuts are coming at a time when Connecticut is hitting a good stride in the battle against homelessness. According to the Connecticut Coalition to End Homelessness, there has been a 69 percent decrease in the number of Connecticut people experiencing chronic homelessness in just four years. Their report also says that Connecticut homelessness is at its lowest since 2007, when the coalition started counting. “The system that’s set up has been working, and we’re a leader in the country on this,” says Mary Ann Haley, deputy director of the CCEH. Haley attributes much of Connecticut’s success to careful resource allocation. Solutions to housing crises aren’t “one-size fits all,” she says. Depending on the situation, the best solution for someone might be help with a utility bill, connections to a domestic violence or veteran’s shelter, rent assistance, or even legal aid. Haley explained that HUD recently provided funding to assist in the housing coalition’s mission to end youth and family homelessness by 2020. Dan Arsenault, Legislative Program Manager of the Connecticut Department of Housing, echoed Haley’s sentiments about the importance of HUD funding. Jamie Kasulis Jamie Kasulis is the Connecticut Mirror’s Summer Data Intern. She is a fellow of the Emma Bowen Foundation for Minority Interests in Media. A junior at Williams College, Jamie is working toward a Bachelor of Arts in Computer Science and Comparative Literature with vested interests in technology, storytelling, and the social sciences. The agency said Facebook’s ad system discriminates against users even when advertisers did not choose to do so. She is getting the job as Gov. Ned Lamont is proposing to the slow the torrent of affordable housing investments under his predecessor to a trickle. Add families who live in public housing or tenants receiving public housing subsidies to the list of those whose lives are being destabilized by the government shutdown soon the become the longest in U.S. history. Data from the five-year American Community Survey tells us that Connecticut homeowners have seen monthly housing expenses decrease, and fewer are spending what is considered a too-large part of their income on housing. But the same improvements haven't been seen by renters, who are increasing in number. WASHINGTON – Efforts to end a partial government shutdown failed Saturday as Congress put off the issue until after Christmas, meaning there's no quick end to closures that will affect about 1,500 government workers in Connecticut and those who need certain services.